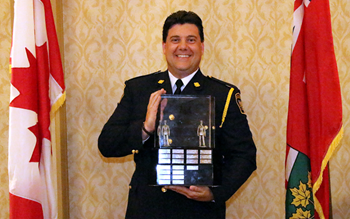 Steve McPherson of the Ontario Ministry of Transportation has won first place for Level 1 inspections at the CVSA’s North American Inspectors Championship. Ontario tends to fare extremely well at this North America-wide competition. I was at the provincial finals in mid-July, where McPherson beat out his Ontario peers to represent the province at the North American competition in St. Louis, Mo. last weekend. That feat wasn’t repeated this year; that honour went to J.D. Berrong with the North Carolina State Highway Patrol. Another Canadian named among the winners was Darren Kennedy of the B.C. Ministry of Transportation and Infrastructure, who scored the highest overall points award among Canadian entrants. More details and full results can be found here. HAS IT BECOME TOO DANGEROUS TO STOP AND HELP? ARE YOU DOING ANYTHING TO PREPARE FOR PC-11 MOTOR OIL?